Ligature Elastic (also known as the “rubber bands”) — Elastics, or rubber bands, are the colored ties that hold the archwires to the brackets. Dr. Thames will change the elastics at each appointment. Elastics may come in a variety of colors. Once placed on your teeth, braces place constant pressure on your teeth, and the force of the pressure helps move teeth into proper position. At each appointment, Dr. Thames may tighten the archwires. In addition to braces, some patients may need to wear rubber bands or headgear. Patients wearing braces may notice their teeth feeling a little loose. This is normal and temporary; once the teeth are done moving this feeling will go away. 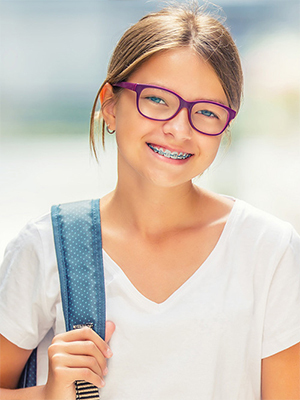 Traditional metal braces are still the most popular, quickest, and most cost-effective orthodontic treatment available. Dr. Thames can help you determine what treatment is best for your individual case. Please contact our practice to schedule an appointment and learn more about how braces can enhance your smile.